The What: tvONE is launching a new streaming media and 4K playback module for CORIOmaster at ISE in Amsterdam (Stand 5-S60). A 4K HDBaseT input module, a new single channel video encoder, dual redundant power supplies for ONErack and the CORIOmaster micro video wall processor are also being unveiled at the event. The What Else: The new tvONE CORIOmaster streaming media and 4K playback module allows digital video from the cloud or the internet to be seamlessly blended with local media and AV connections and presented together on a video wall in any desired configuration. Compatible with the CORIOmaster, CORIOmaster mini and the new CORIOmaster micro, the innovative module offers dual channel 1080p60 streaming media as well as file playback, via USB3.0, of any resolution up to UHD/4K on the main channel and 1080p/60 on the secondary channel. Features include on-board 16Gb storage for video/still playback expandable to 128Gb. Using CORIOgrapher design and control software, IP feeds and locally stored media can be ordered into a playlist and played out in a queue. 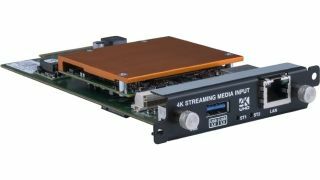 A new 4K HDBaseT (dual) input module allows uncompressed, high resolution 4K Video to be input into the CORIOmaster, CORIOmaster mini and CORIOmaster micro from stand-alone transmitters located up to 150m away.